Hypocenter depth recalculated from 595.0 to 593.0 km. Hypocenter depth recalculated from 593.0 to 595.0 km. Hypocenter depth recalculated from 595.0 to 592.0 km. Sep 8 23:40: Magnitude recalculated from 4.9 to 5.0. Hypocenter depth recalculated from 592.0 to 590.0 km. 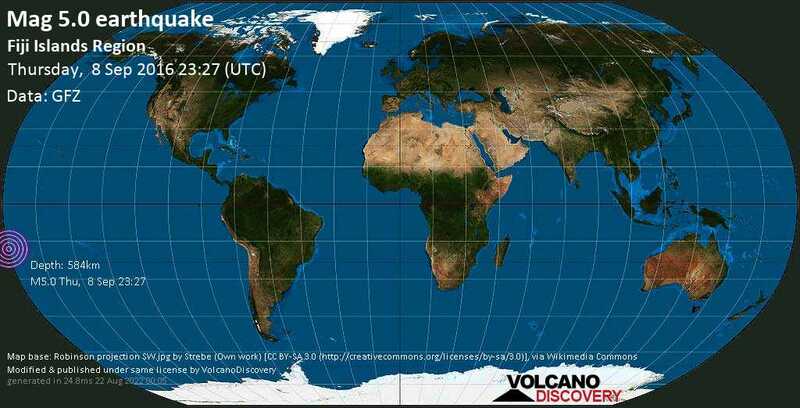 Sep 8 23:40: Magnitude recalculated from 5.0 to 4.9. Hypocenter depth recalculated from 590.0 to 583.0 km. Hypocenter depth recalculated from 583.0 to 584.0 km. Sep 8 23:41: Magnitude recalculated from 4.9 to 5.0.